The Nice Hotel, the cozy hotel at Patong beach Phuket sets amongst comfortable atmosphere, Newly renovated and opened this gem of a privately owned hotel the perfect location and amenities at budget price. Our staffs are friendly, courteous and helpful. The Nice Hotel offers 18 guestrooms with fully amenities and facilities. We accentuates in cleanliness for your real relaxation in your holiday. 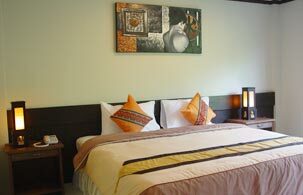 Furthermore, other services are 24 hrs, laundry, free internet, bar, The Nice Restaurant, etc. Because we believe the paradise of your relaxation is waiting for your visiting at The Nice Hotel .In order to have a great holiday it is important to choose the hotel you are staying at carefully. And it is sure to be the kind of establishment that will remain in your memory as a special discovery. Forget the big impersonal hotels. If you are looking for the personal touch in stylish surroundings, The Nice Hotel is the place to stay only 100 M. from the beach in Patong.